Israel intensified its attacks against Lebanon striking a major highway, imposing a naval blockade, twice hitting Beirut's airport, and blasting two Lebanese army air bases near Syria. 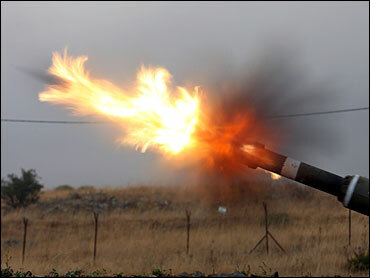 Hezbollah fired more than 120 rockets into Israel, which said one also struck the port city of Haifa. Hezbollah, a Shiite militant group denied it had rocketed Haifa, where no injuries were reported, though two days of violence elsewhere left at least 57 people dead on both sides of the border. The crisis began with a Hezbollah raid on Israel that resulted in the capture of two Israeli soldiers. The Israeli ambassador to the United States, Daniel Ayalon, called the attack on Haifa "a major, major escalation." The city, 30 miles south of the border, is home to 270,000 residents and a major oil refinery. "Those who fire into such a densely populated area will pay a heavy price," said David Baker, an official in the Israeli prime minister's office. Hezbollah's deputy leader Sheik Naim Kassem denied that the group had fired on Haifa, telling Al-Jazeera by telephone that the group would do so if Beirut or its southern suburbs were attacked. Israeli warplanes struck the highway linking Beirut to the Syrian capital of Damascus early Friday, but the main artery remains open, Lebanese security officials said. Fighter jets attacked a highway section in the mountains of central Lebanon, in Mdeirej. But the targeted area was an old road extension, and the bridge on the nearby main highway remains intact, the officials said. The highway, which connects Beirut to Syria, is one of Lebanon's only links with the outside world since Israeli forces imposed a sea, air and land blockade of Lebanon on Thursday. Late Thursday, helicopter gunships fired missiles on Beirut's airport, setting fuel tanks ablaze, Lebanese security officials said. TV footage showed flames shooting up from the airport. Warplanes earlier punched holes in the runways and at two military air bases. Israel's army chief Brig. Gen. Dan Halutz warned that "nothing is safe" in Lebanon and said Beirut itself — particularly Hezbollah offices and residences — would be a target. Maj. Gen. Udi Adam said Israel had hit hundreds of targets and hadn't ruled out sending in ground troops. By bombing the Beirut airport and imposing a naval blockade, Israel is trying to stop the flow of supplies to Hezbollah, reports CBS News correspondent Robert Berger (audio). Lebanese officials say about four dozen people have been killed in air strikes across the country. One Israeli woman was killed Thursday in a rocket attack. "I don't think Israel really overplayed its hand," says CBS News Middle East consultant Fouad Ajami. "I think it was a crisis that (Israeli) Prime Minister Olmert had to respond to and he's doing his best to control the terms of it." The Israeli army said Hezbollah fired more than 100 rockets into northern Israeli towns, killing a middle-age man and a woman and wounding more than 35 civilians. Hezbollah said it was using a new missile that appeared to be more advanced than previous models. A total of half a million Israelis were within range of the barrage. One rocket even hit the headquarters of the Israeli army's northern command. Hotels in northern Israel sent guests packing Thursday, hospitals moved patients to their basements and canceled elective surgeries, schools shut down and authorities warned residents of Israel's third-largest city, Haifa, to stay near bomb shelters during the heaviest rocket barrage of northern Israel in decades. In Lebanon, two days of Israeli bombings, the heaviest air campaign against its neighbor in 24 years, had killed 47 Lebanese and wounded 103, Health Minister Mohammed Jawad Khalife said. Eight Israeli soldiers have been killed. Both sides played a high stakes game following the capture of the two soldiers by Hezbollah: Israel sought to end Hezbollah's presence on the border, while the guerrillas insisted on trading the captured soldiers for Arab prisoners. Sandwiched between the two sides was Lebanon, which Israel said it held responsible for Hezbollah's actions. Hezbollah fighters operate with almost total autonomy in southern Lebanon, and the government has no control over their actions. But Lebanon has long resisted international pressure to disarm the group. "The Party of God gets its funding from Iran, the Party of God gets its instruction and guidance from Iran," says Ajami. The timing isn't so good for the Lebanese people, who were looking forward to the height of tourist season. "There is a contradiction, if you will, between the desires of the Lebanese people for normalcy and the desires of the Iranians," Ajami said. "The Lebanese government must send the Lebanese army to its border with Israel. It must be responsible for its own border and responsible for its own policy," said Ajami, a Palestinian-American. "Hezbollah has to be disarmed. That's really the heart of this crisis. ... You cannot have a sovereign government and a vastly armed militia side by side." The Israeli warnings of more attacks caused panic in Beirut, and many people stayed home from work. Long lines formed at gas stations and supermarkets. The eight Israeli soldiers killed so far is the highest death toll for the army in four years. Three soldiers died in the initial Hezbollah raid, and four were killed when their tank ran over a land mine Wednesday. Israeli Foreign Ministry spokesman Mark Regev said Israel had information Hezbollah was trying to transfer the two captured soldiers to Iran, which backs Hezbollah. He did not disclose the source of his information. After hitting roads and bridges in the south all day Wednesday, Israel dramatically expanded its campaign Thursday with their biggest offensive in Lebanon since Israel's 1982 invasion. Israeli warships imposed a naval blockade of Lebanese ports, and the Israeli military said it could also target the Beirut-to-Damascus highway, the main land link between Lebanon and the outside world. Military jets attacked runways at the Rayak air base in the eastern Bekaa Valley and at the Qoleiat air base in the north. Rayak, four miles west of the Syrian border, is home to the country's main military air base. Because Lebanon's army has no operational fixed-wing aircraft and only operates helicopters — which can take off or land anywhere — the attacks appeared to be mostly symbolic. Israeli planes dropped leaflets on the southern suburbs of Beirut, calling on residents to avoid areas where Hezbollah operates. Israeli Defense Minister Amir Peretz said his forces would not allow Hezbollah guerrillas to occupy positions along the southern Lebanese border. "If the government of Lebanon fails to deploy its forces, as is expected of a sovereign government, we shall not allow Hezbollah forces to remain any further on the borders of the state of Israel," Peretz said. Brig. Gen. Yossi Baidatz, commander of the research arm of military intelligence, told a parliamentary committee Thursday that Hezbollah had about 100 missiles with a range of 25 to 44 miles, a participant in the meeting said. That would put the cities of Haifa and Tiberias within range. The participant didn't name the missile. Travelers to and from Beirut were stranded all over the region and beyond after the airport strike. Among them was Foreign Minister Fawzi Salloukh, who was returning from a visit to Armenia and — like many — was forced to make his way home through Syria. The main terminal of the $500 million airport remained intact. The Israeli military said it struck the airport because it is "a central hub for the transfer of weapons and supplies to the Hezbollah terrorist organization." It was the first time since Israel's 1982 invasion of Lebanon and occupation of Beirut that the airport was hit by Israel. The Israelis in 1968 sent commandos to Beirut airport, blowing up 13 passenger planes in retaliation for Arab militants firing on an Israeli airliner in Athens. Meanwhile Israel continued its attack on Gaza, bombing the Palestinian Foreign Ministry early Thursday, collapsing part of the structure and causing widespread damage in the area. The Israeli military confirmed it had carried out an air strike on the ministry, noting that it is "led by Hamas." Israel's offensive is aimed primarily at Hamas, which claimed responsibility for the capture of the soldier in a cross-border raid on June 25.